a nice balance to the sweet cinnamon sugar filling and the buttery, flaky crust. I didn’t always like apple pie. That all changed when I learned about apple pie à la mode. Two desserts on one plate? Okay, you’ve got my full and undivided attention. Growing up, I assumed “à la mode” was French for “with a scoop of vanilla ice cream.” When my friends and I would play house/restaurant/cafe, we would order everything à la mode. Even at birthday parties, it was birthday cake à la mode. If you were one of the younger kids out of loop, you didn’t get a scoop of ice cream. Silly, I know. Imagine my horror when my started studying French. On the first day of class I learned that à la mode had nothing to do with ice cream. I was crushed. I was fooled for all those years. After that mishap, I wouldn’t let myself be fooled by French words again. 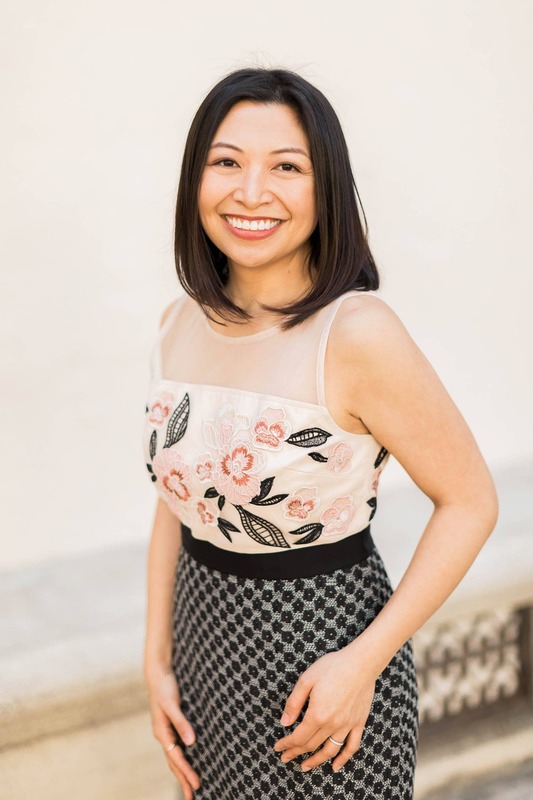 I continued to study French for six years throughout high school and college. Naturally, if I am going to serve apple pie, you betcha there’s going to a scoop of ice cream. Move over vanilla ice cream, I found a better flavor more suited for apple pie: whiskey ice cream. I like to pile on the apples. The more the better. 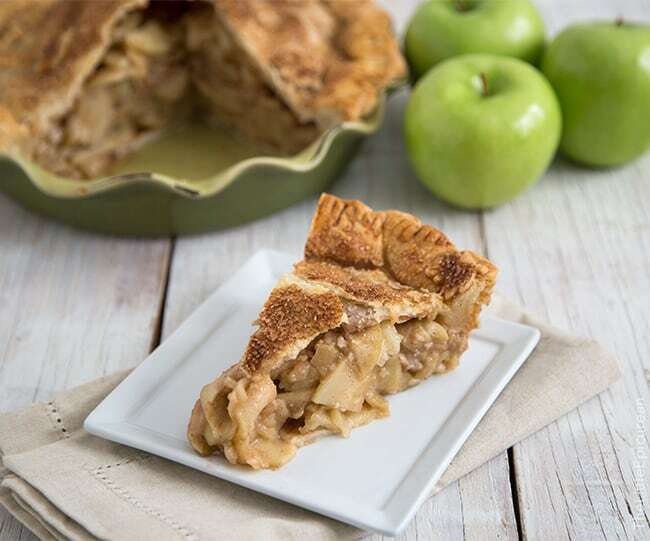 I prefer to use tart Granny Smith apples because it balances well with the sweetness of the cinnamon sugar and the buttery flakiness of the crust. 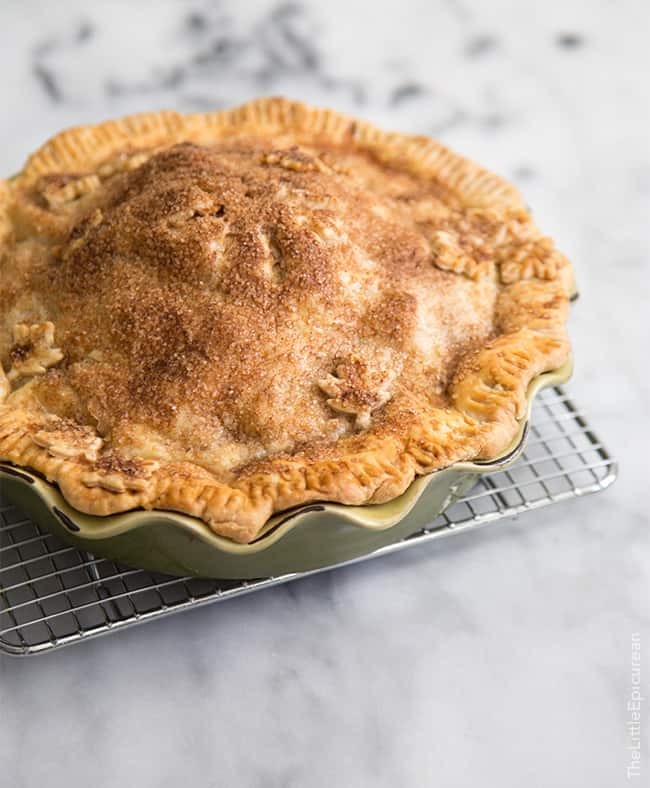 And to add more richness and flavor to the apples (and adds more steam inside the pie during the baking process), I sprinkle butter all over the apples before placing covering the pie with the top crust. 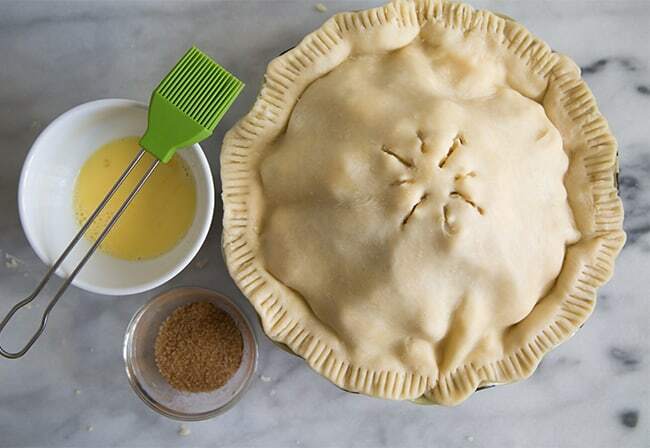 Crimp, pinch, or decorate the edges of the pie as desired. 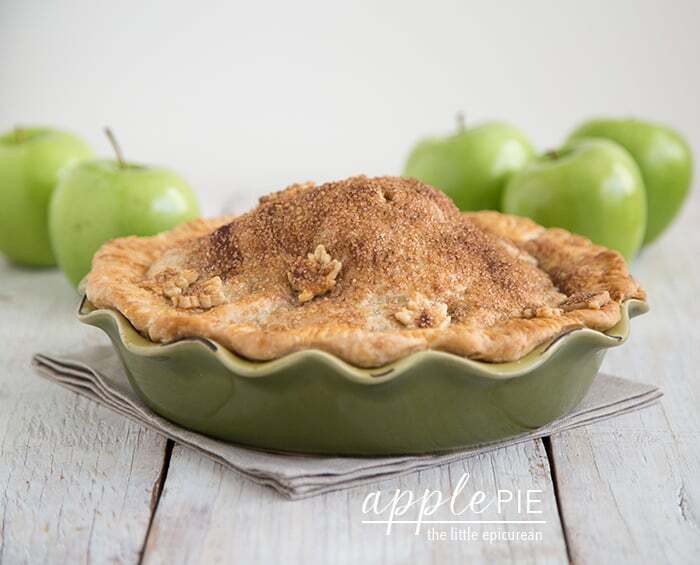 Be sure to add vents on the top of the apple pie, otherwise the pie may burst or ooze in the oven. All the steam from the apples need a place to escape. While you could simply brush the top crust with egg wash, I want more! The turbinado-cinnamon mixture adds additional crunch and spice. Using the dough scrapes, I cut out little leaves to further decorate the apple pie. Lightly dust work surface with flour. Roll out larger piece of dough to a circle 1/4-inch thick and about 13-inches in diameter. Transfer dough to 9-inch pie plate. Press the dough to the sides and bottom of pie plate. Allow excess dough to hangover plate. Cover with plastic wrap and keep chilled in the fridge. Roll out smaller piece of dough to a circle 1/4-inch thick and about 11-inches in diameter. Cover with plastic wrap and leave at room temperature while you prepare apples. Apple Filling: Whisk together brown sugar, flour, cinnamon and salt. Set aside. Wash, peel, and core apples. Slice apples to about 1/4-inch thick. Place sliced apples in a large bowl. Add lemon juice and toss to distribute. Add brown sugar mixture and fold to coat apple slices. 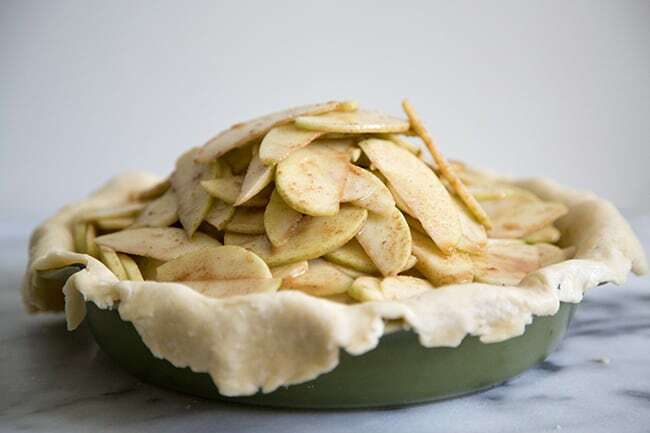 Place apples in dough-lined pie plate, making a mound in the center. Distribute cubed butter over the apples. Place remaining rolled dough over apples. Cut vents in the center of the dough to allow steam to escape during baking. Trim excess dough, leaving about a 1-inch overhang. 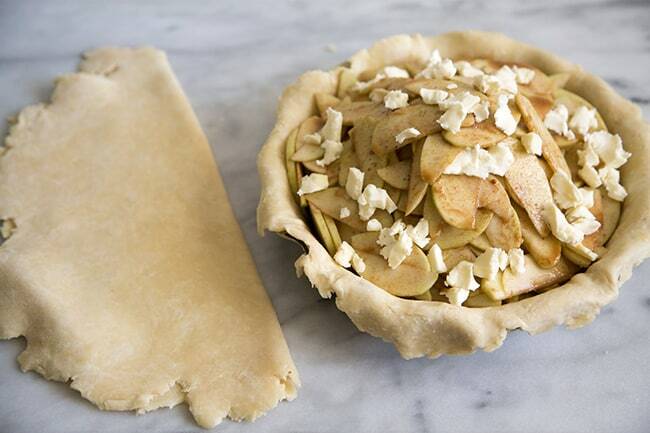 Fold overhang into the pie and flute the edges with a fork, or crimp with your fingers. To make egg wash: whisk together egg and milk. Lightly brush the top of the pie with egg wash. Sprinkle with topping. To making topping: whisk together turbinado sugar and ground cinnamon. Sprinkle over egg washed pie. Plate pie plate on a baking sheet. Bake for 15 minutes. 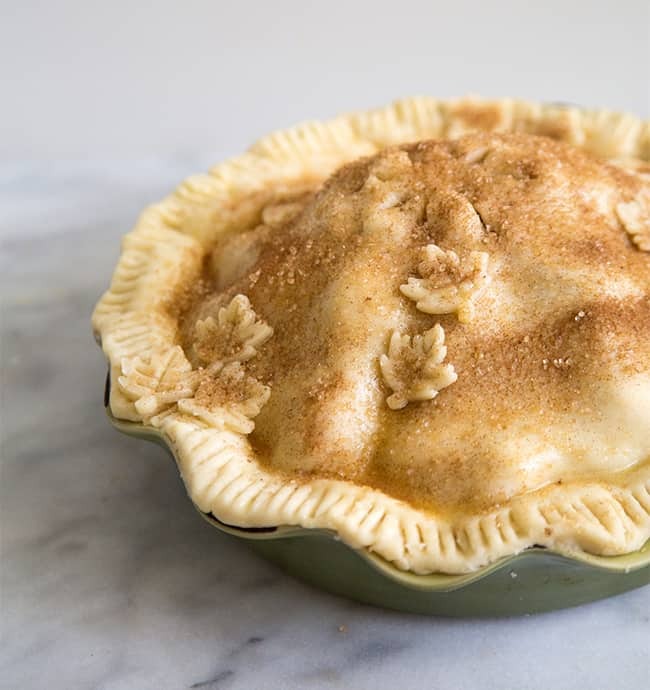 Reduce oven temperature to 350 degrees F. Bake for another 40-45 minutes, rotating pie halfway through baking. Bake until top of pie is golden brown and apples are tender. Test to see if apples are done by piercing a knife through the vents. Let pie cool to room temperature on a wire rack. Serve at room temperature. Place butter and shortening in the freezer 10 minutes before making pie dough. In the bowl of a food processor, pulse together flour and salt. Add the chilled butter and shortening. Pulse until texture resembles coarse sand. Add 1/4 cup cold water. Pulse. Continue to add water 1 Tbsp at a time until dough almost comes together. Turn dough out onto a clean working surface and push dough bits together into a cohesive mass. Divide the dough into two pieces, on slightly larger than the other. Flatten the two pieces and wrap separately in plastic wrap. Chill in the fridge for at least 1 hour, up to 2 days. Remove dough from fridge and let stand at room temperature for a couple minutes until pliable. Apple pies are the best. Yours is completely adorable. I love your little leaf cut outs, super cute. Now THAT’s an apple pie! SO cute. Love it! I love apple pie, and with ice cream?! whats not to love?! I have green apples, flour, cinamon, brown sugar; so I begin to cook this delicious cake!!!!! Mmmm – Can I please live in your house for the next month?? I just want to eat everything that comes out of your kitchen! This looks like the PERFECT apple pie and those little leaves make it look so fancy. 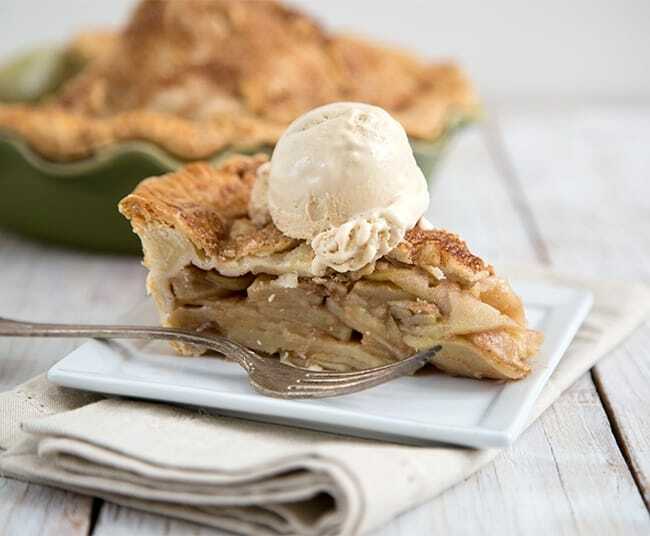 Whiskey ice cream on a gorgeous apple pie?!?! A girl after my own heart…this pie looks amazing, and I give you props for such a gorgeous crust. Pinned! This is probably the best looking apple pie I have EVER seen. I love that large apple hump in the middle especially.. I can only imagine how good this pie must have tasted!